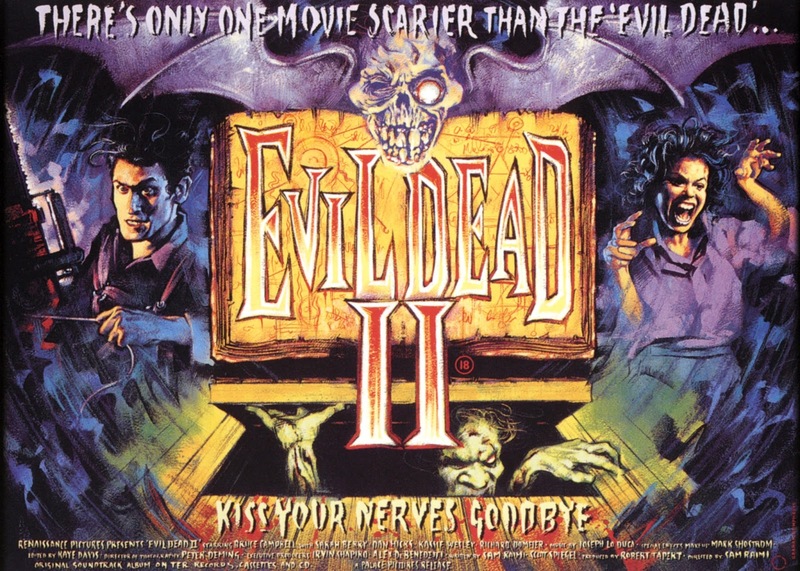 Before we get started, yes, Evil Dead II (1987) (Or Evil Dead 2: Dead by Dawn, depending on what publicity material you read at the time) is a sequel. You'll find an alarming amount of film scholars and horror enthusiasts telling you that it's a remake of the The Evil Dead (1981). Perhaps they're confused by the sudden shift in tone from one of sheer terror to one of comedic horror? Or maybe it's the fact it's liberal with its recap of the previous film? Or is it the fact that all the events take place in the same cabin in the woods? Either way, there's a big fat 'II/2' there in the title. It's called Evil Dead II. If it was a remake it would be called Evil Dead and would have come out in 2013 and then turned out to be a sequel anyway. Secondly, Evil Dead II explicitly acknowledges the events of the first film. Yes, as mentioned above, it's very liberal with its retelling of the events that lead up to this point in the film, cutting out everyone apart from Ash (Bruce Campbell) and his girlfriend (Denise Bixler), but it's just a recap. It only serves to get you up to speed with the story so far: Ash and Linda go for a trip to a cabin in the woods, Ash has crap taste in presents, there's a book that when read aloud summons spirits which try to make them die, Linda dies, Linda un-dies, Ash chops her up, Linda un-un-dies, Ash gets a beat down from an invisible spirit. It's the original's essentials before deviating off on its own continuation for the best part of the film. If it was a remake, on the other hand, It would remake the plot of the first movie. Now that's out of the way, why is this my favourite horror sequel? It's a bit obvious isn't it? Well, if you pop over to the section listing the Haddonfield Horror crew's top 50 films, you'll see it's also my favourite horror movie of all time. What element of it is most responsible for this? That's very hard to pinpoint. Most obviously this could be laid at the feet of the ultimate horror hero in his ultimate incarnation. Horror is the genre where the villains and monsters are the stars, a tradition that dates back even before books like Frankenstein; or, The Modern Prometheus (1818) or Dracula (1897). Its they who spark most of the plot and actions, and so its they who we're most fascinated with. Far more rarely does the hero or heroine of the story stand out more than the monsters. Sure, there's Father Lankester Merrin (Max von Sydow) in The Exorcist (1973) or Donald Pleasance as Dr. Sam Loomis in Halloween (1978), but no one, in all of horror, comes close to Bruce Campbell's wonderful performance as Ash Williams. In Evil Dead II Ash is a swaggering badass who has absolutely no right to be, and yet because of what he's gone through, simultaneously has every right to be. Ash has gone through hell for 24 hours, and at the start of the film we know he's heading for a consecutive double dip. He has no training, no help, no escape and no sanity, but because of the events that he's experienced the previous day, it's that lack of sanity which gives him what he needs to make it through. Had he not been through events which made him lose his mind, would he really have had the courage, and apparently delirious satisfaction, in chopping off his own possessed hand with a chainsaw? Ash Williams shouldn't have survived the things he has; so the fact he has means anything's possible, and gives him a wonderful mental invulnerability. In a way, his trauma and madness are his special ability which allows him the assume that what he's about to do, whatever that is, will work, simply because it has to. Bruce Campbell puts in a wild performance and fully realizes the now manic and cocksure nature of Ash. He is the absolute embodiment of reckless, mad, confidence and the bravado that must surely come with it. We also get to see what a marvellous physical comedian Campbell is. Moments that really convey completely lunacy, like when he mimics a moving desk lamp, or cuts his own hand off, are wonderful to behold. Who can forget the genuinely epic fistfight with himself in the kitchen. His performance manages to make his hand legitimately seem like a its possessed by another entity - its skilful and clever. Equally skilful is Campell's ability to flip himself head over heels with his own hand. It's unfathomable that Campbell didn't go on to do bigger things after this, Burn Notice (2007 - ) granted. Perhaps it was because Army of Darkness underwhelmed upon release. Either way, it's a real shame. However, it might be the tone of the film that echoes its heroes insanity. 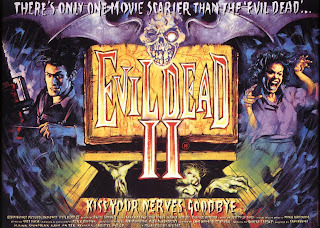 While The Evil Dead is a pastiche, Evil Dead II is a parody. It is completely mental, and instead of displaying the lead character's mental instability, it goes along for the ride, so much so that one might not even be aware of Ash's madness as the film refuses to put it into a context of sanity. It's a brilliantly logical decision; Ash has and does spend a lot of time alone with his madness, and does the mad mind know it is mad? Of course not, this is just how the world is, and thus, how the film is. Therefore the camera angles are flat-out ridiculous; camera transitions are made from beneath Ash's shoe sweeping over the screen and roof rafters that pass by do so with a weird noise for absolutely no reason. Yes, the film has apparently also gone mad. Whereas in the original film the blood was decidedly blood coloured, here the liquids that spew from the house are a wide array of bright and dark colours. Moments that would have torn Ash's psyche apart in the original film, have indeed torn his psyche apart, so now Ash often confronts these moments with entirely understandable hysteria. The ultimate sign of the film's own insanity is the fact it meta-textually imbues Campbell with the frankly ridiculous ability to dismantle a chainsaw, reassemble it around his wrist-stump, and have it not only still operate, but now have it revved by, what, his nerve endings? On the other (severed) hand, it might be because of its 'moments'. Some of the most iconic moments in horror movie history at that. Evil Dead II has moments which have become a touchstone for every cineliterate generation after it for their sheer inventiveness and/or bravado. Moments like when Ash cuts his own hand off on the bloody floor of the kitchen. Moment's like when that same hand then runs around and gives him the rod as its former owner takes pot-shots at it with a boomstick. Moment's like when the cellar witch starts rattling under the floorboard screaming "I'll swallow your soul! Dead by dawn!" Moment's like when Ash 'suits up' for his trip beneath the cabin and utters the immortal line "groovy." These moments and more come much like the blood in Evil Dead II: thick, fast and constantly. I could mention myriad other elements of Evil Dead II alongside these. The wonderful design work on the monsters and gags, the frenetic pace of the camerawork and the film itself, the cracking gore and violence, the ultimate twist ending, the hilarious comedy... but frankly you'd end up with a book. It's fair to say though that it isn't really one of these things more than the other, it all mixes together like so much spilled gore upon the floor of that woodland cabin. The film is just rammed with ideas, enthusiasm, invention, and quality in every department from start to finish and epitomises the true spirit of horror filmmaking. Even now I get foggy eyed, thinking back to all those years ago to when I first saw it. Transfixed to the small television in my room at two in the morning when I should have been asleep and definitely not watching movies like that is, perhaps, the best way to watch the film for the first time. It was during those 84 minutes that I realised everything horror could be, and that I would love it, and that the sequel to the ultimate experience in gruelling terror would make me kiss my nerves goodbye.